Raise a voice against police misconduct in India! India is a country where every person or group in authority assumes autocratic power. Whether it is your local welfare association, development authority, MLA, MP or Police. They unabashedly abuse the power given to them by the public to serve them. They thrive on feeling powerful and in control – An unfortunate misuse of taxpayer’s money. When was the last time you felt satisfied by the steps taken by the police to address your grievance? Were they sensitive? Did they listen to you properly? Did you ever get a proper account of the follow up conducted? Was your grievance ever really solved or did you just move on due to lapse of time? Or, when was the last time you were harassed by the police in the following ways: (i) Verbal intimidation (ii) Verbal abuse (iii) Unlawful detention (iv) Mental torture (v) false accusation (vi) Been asked for a bribe and (vii) Physical torture? Or known someone who has been harassed by the police? When was the last time you truly felt safe calling the police? 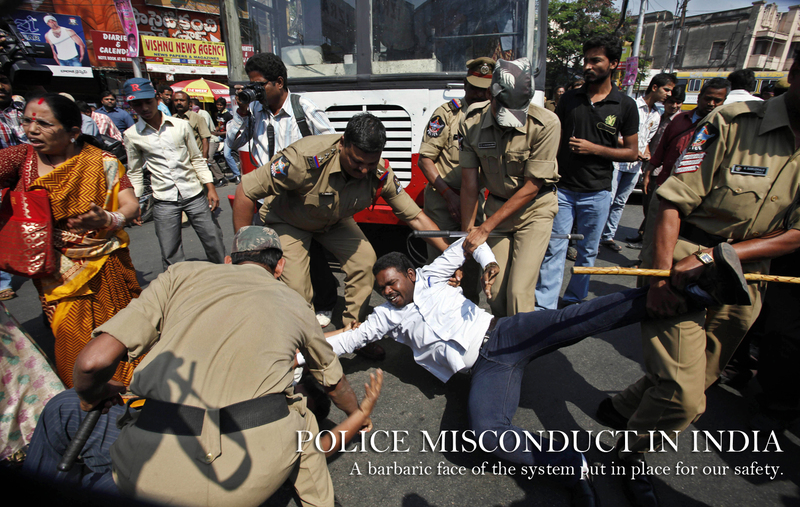 Unfortunately, Police misconduct and human rights violations are commonplace in India. What should be an exception is treated as a norm. People are illegally detained and tortured in police stations for days at a time. Abusive intimidation tactics that know no boundaries are incessantly used to break a person. False charges and accusations are lodged in order to get their way. Stalling or slowing the process down of FIR retrieval, deliberate attempts to not follow up a case, delay carrying out an investigation to let mitigating factors come into play are some of the other ways in which police abuses it’s power. The citizens are extremely fearful of the police. The moment you see a police car next to your house, you start panicking. The kind of fear that the police induces in people is astonishing and shocking. It’s hard to believe that this establishment has been put in place for our own protection and well-being. No one wants to go against the police. No one wants to fight them in case they trap them in a false charge or build a criminal case against them. No one wants to even get involved in a police case. This is the way the police manipulates the citizens to follow their command. They have led people to believe that their authority is absolute and binding, and that they can make life difficult for anyone who opposes them. Why is this happening? Why, in a country that preaches “of the people, by the people, for the people”, is letting such shameless harassment of it’s people go unnoticed? Unfortunately, the answer is that there is no mechanism in place to hold the police accountable for their actions. When something bad happens to us, we’re supposed to go to the police. But where do we go when the police does something wrong to us? Any answers? A Police Complaints Authority has been put in place for namesake. You can go to the court but the Indian judicial system is slower than a snail on wheels. You can file a complaint in NHRC, but they too, take their time. Bottomline is there is no independent authority that can be summoned immediately when you are being harassed or abused by the police. There is no helpline that will respond to your grievance and set up a case against the officer in question. We need an authority that induces the kind of fear in the police that they induce in the public. They need to know that someone is on their watch, that they cannot misuse the power given to them. We also need CCTV cameras to be installed in every room of every police station, so that they cannot detain or torture illegally. Every concerned citizen should be allowed to access the footage. I have made a petition to get supporters for this cause. The reason that I have made this petition is because I have personally gone through a harrowing experience with the police recently, where I was manhandled, abused and denied of basic rights. I was shocked at the sheer injustice of it all and realized that something needs to be done about this. I plan to file a PIL in the supreme court if I manage to get enough volunteers and signatures. So if you agree with me, please sign this petition and forward it to as many people as you can. Raise a voice against Police misconduct and harassment! – Please sign this petition!